Truth be told, the reconciliation between Basques and Icelanders took place many centuries ago, as evidenced by the existence of both the Basque-Icelandic pidgin, documented since the seventeenth century, and the Vináttufélag og Baska Íslands (Iceland – Basque Country Friendship Association) , which is one of the main protagonists of the story we will tell you. But, rather than a reconciliation (which took place long ago –centuries- as we just said) this is a Commemoration of the Fourth Centenary of the Massacre of Basque whalers in Iceland, which occurred in 1615, when some Icelanders killed 32 Basque sailors who had landed at the island’s coast on September 20th, 1615, after the three whaling ships they were sailing in hit an iceberg. On the 19th, 20th, 21st, and 22nd of April a series of events will be held in Iceland to remember that tragic event: tributes, cultural and academic activities, as well as visits to the places where the Basques created the processing centres for the whales they fished there. The full list of these events can be found on the Instituto Vasco Etxepare website. Iceland and the Basque Country will be symbolically reconciled through this event. Xabier Irujo, a descendant of one of the dead whalers and Magnús Raffnson, a descendant of one of the massacre’s perpetrators, will carry out this act of reconciliation. They will unveil a plaque placed on a stone in front of the Museum of Witchcraft in Holmavik, in honour of the 32 fishermen from Guipuzcoa that were killed in 1615. Visiting the archaeological excavations in one of the areas in which the Basque whalers operated (Basque Whaling station), with the help of both the archaeologist and researcher Ragnar Edvardsson and the Icelandic historian and researcher Magnus Rafnsson. We enthusiastically welcome this act in remembrance of an essential part of the Basques’ history, to which all the institutions of our country will contribute. The Basque whalers took the North Atlantic as their own “sea” and they were even called to the southern hemisphere by the Portuguese to set up the whaling industry in its colony of Brazil. A relationship so old that it was almost lost in history . 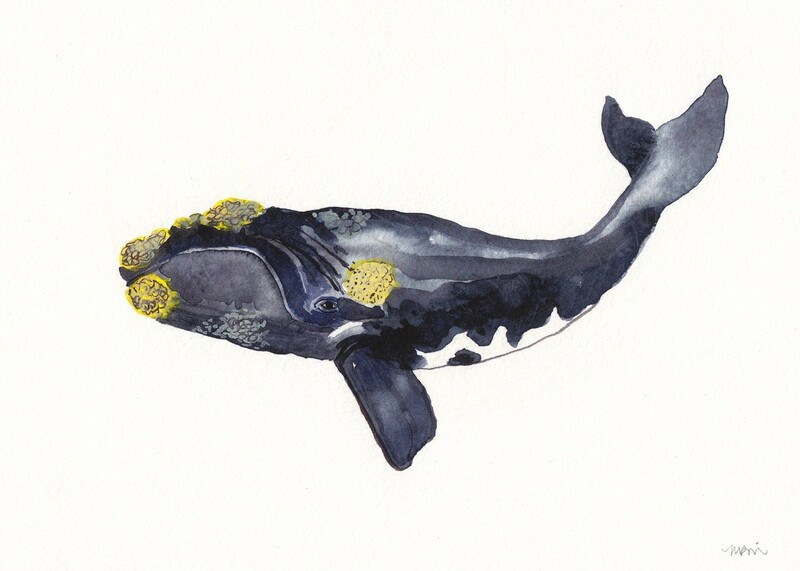 Basque whale; illustration made by the American artist (Dover, New Hampshire) Michelle Morin. You can see her work (and acquire it) here . We are deeply delighted, as we still feel sad when we remember how there was no Basque representation in the delivery of three bronze plaques (in English, French and Basque) made by the Unesco to the Government of Canada last summer, where the Red Bay’s Basque whaling station was recognized as a Heritage of Humanity site. Fortunately, this time it will be different. Production and organization of these celebrations have been made ​​by the Instituto Vasco Etxepare and the Association of Friendship between Iceland and the Basque Country (AIB) and are sponsored by the Provincial Council of Gipuzkoa and the Government of Iceland. We heard rumours that Guillermo Zubillaga, who wrote a trilogy called “Joanes or the Basque Whaler ” about the Basque whalers in the Gulf of St. Lawrence, has embarked upon the adventure of making a comic book about this part of our history. You can read the information about the Icelandic daily where we saw the new (thanks to a “tip” from Begoña Sánchez Estíbaliz, a Basque who’s living in that country and a person to whom we will soon dedicate a “post” on our website due to the interesting things she is doing) as well as two fascinating videos where this story is told.